Moving long parts through multiple processes in manufacturing. Ever notice the size of those overhead highway signs that we all rely on to get ourselves to where we need to go? 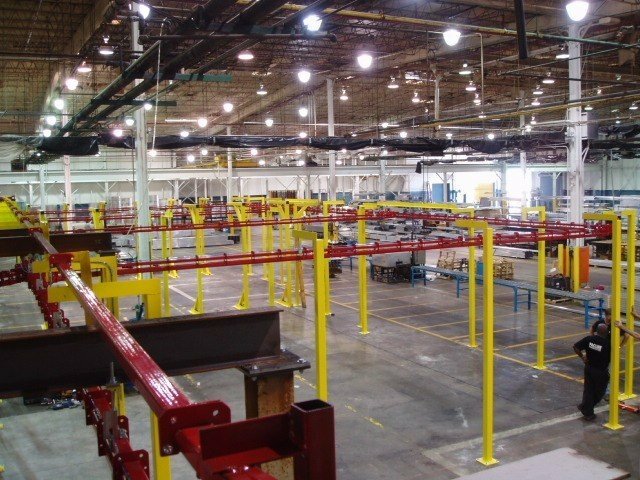 As a manufacturer or material handling organization you may wonder how items such as these – up to 50 feet long – can be maneuvered through various assembly and finishing processes. ROCAL Inc. located in Frankfort, Ohio was facing this issue in the manufacturing of their large highway signs. ROCAL produces a wide range of signage products including highway signs, regulatory and specialty signs. Part of the production process for ROCAL’s aluminum signs involves a wash and chemical treatment process of the individual panels that are bolted together to make the final sign. When ROCAL came to PACLINE, this part of the process was being done outside of ROCAL’s facility and they wanted to find a way to handle this process in-house rather than outsource it. 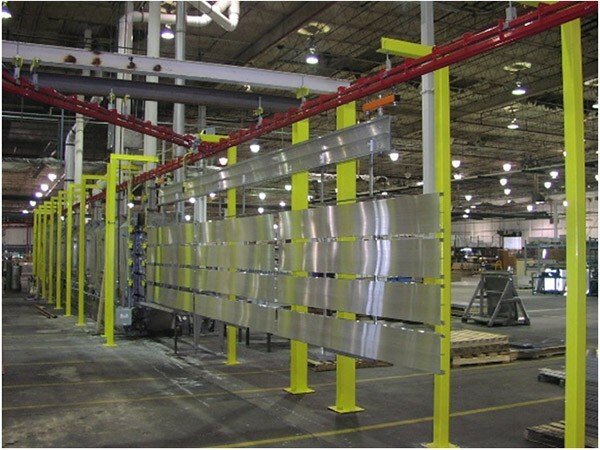 So the challenge was how could ROCAL carry panels up to 50 feet long within their existing manufacturing plant in a manner that would both be time and cost efficient. After consulting with PACLINE engineers, a compact layout was configured that both automated the feeding of panels through the washer and treatment process, while minimizing the overall footprint of the system. To meet all the requirements of this application a Pacline Power and Free conveyor was selected. This conveyor system offers the flexibility of using both manual and powered sections. In addition, the powered portions can automatically buffer carriers by accumulating them in the same manner as cars accumulate behind a red light. It can also control the flow of carriers and release them one at a time. This accumulation and control is key to both minimizing the manpower required and maximizing the throughput of the system. The first step of the solution is loading the conveyor. To minimize handling of panels, the loading of the conveyor was positioned right next to the punch press where mating holes are punched into the sign panels (holes are used for final assembly). Once the holes are punched, an operator loads the panels onto the carriers of the power and free conveyor system. 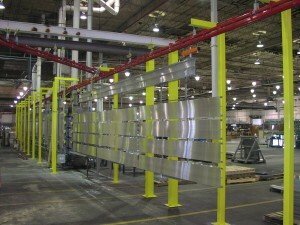 Each carrier was designed to hold multiple panels for maximum efficiency. Next the carrier is pushed forward into a powered section of the conveyor where it is automatically queued by the power and free conveyor system in preparation for the wash treatment. Although the panels can be very long, they are only about 3-inches thick. This combined with the automation of a power and free conveyor is the key to being able to buffer the panels for automated feed into the washer. Using a switch, the power and free conveyor splits into two lanes (with the front part of the carrier on one lane and the rear part of the carrier on the other), so the panels can be accumulated parallel to each other (like two tractor trailers parked parallel to each other instead of end-to-end). Because the panels can “slide” sideways by splitting into two lanes, they do not need to navigate around large curves, dramatically reducing the floor space required. Before feeding panels into the washer the two lanes merge into one lane again and the panels can now go through the washer lengthwise. Additionally, some panels are 50-feet long, but others might only be 20-feet long (or less). To minimize wasted energy of running the washer during gaps between panels the custom control system senses once the longest panel on a carrier has cleared the entrance of the washer and then immediately feeds the next carrier into the washer. This saves energy costs and also maximizes the throughput of the system by not leaving gaps. Once the panels complete the processing they automatically queue for unloading by once again splitting into two lanes and accumulating parallel to each other. An operator unloads the panels and brings the carrier to the punch press location to start the cycle over again. The PACLINE Power and Free overhead system met all of the project expectations and objectives as well as preparing ROCAL for future growth of their business. With efficient in-house processing, ROCAL can now easily handle sings up to 50 feet long, in a restricted space and achieve faster turn-around times.